This was a collage sermon of three members of Lyndale at different life stages – high school, mid-life, and retirement – sharing their understandings of vocation. Rev. Ashley closes with her own evolution of vocation around becoming a parent. You all may be wondering “why is that girl that isn’t even legally an adult standing up there about to talk to us about vocation?” Well… you’ll have to ask Ashley. I guess (and hope I’m right) it’s because I’m at that stage in life where I’m just starting to figure out what my vocation would be. There are a lot of questions that keep coming up: what if, in the long run, I find that I don’t enjoy it as much? What if it’s to risky and I have to settle for way less than what I wanted? What if, in a few years, I’m completely miserable? I need to decide now, or at least relatively soon, if following a dream is worth the risk and, honestly? I don’t have any idea on how I’m supposed to figure that out. I have my whole life ahead of me, but I can’t tell if that’s a good thing. I can’t really get a specialized job until I’m either close to or have graduated college, and then I don’t know if I’ll even get one, especially since the fields I want to go in to are so competitive. I’m up at night wondering what I’ll do when I go to college or after. Am I willing to move halfway across the the country just to have a better chance at the career I want? Will I be able to support myself or a family? It all just makes me want to fast forward a few years. But that’s not how life works and there that whole cheesy thing about the journey is what counts, not the destination. I’m just not entirely sure I’m ready to go on that journey just yet… and I’ve got about two months to figure it out! I’m honestly the most scared I’ve been in awhile. I want to be able to handle myself financially but I don’t want to just quit fighting for a possibly-hopeless dream and go with a back-up plan that I wouldn’t take as much pleasure in. I need to even be figuring this out now as I make my college decision. Should I go to a school specific to my dream career but might not necessarily provide me with a back-up plan? Or do I go with a school that would allow me to do the same thing but not as in-depth and isn’t known as much for their program but would provide me with a strong alternative career should I need it? I’m at a crossroads with my vocation and I just have to have faith that I’ll end up where I need to be. I did not hear a voice with a blinding light like Paul; Instead, l encountered a slender, sanctified, silence, that somehow spoke without speaking, to the yawning, nagging, abyss, at the center of my nervous system. Externally, l had a healthy marriage with healthy children. I was the embodiment of the heteronormative Bermudian Dream. I had made it. Why then was this experience so anticlimactic? I felt cheated and duped. I wasn’t even excited. l discovered that l was afflicted with the problem that has no name. I became my own aporia. My material success wasn’t enough to feed the insatiable beast, the hole in my soul. It was then, beckoning from beyond the horizon, that l heard a faint, almost inaudible voice, of slender, sanctified, silence and l became convicted of the need to change direction without a plan or prior destination. I had neither a GPS, map or compass. I talked to Leondra then I quit my speechwriting job with the Bermuda Government. I cashed in my retirement and left Bermuda to attend Howard University’s School of Divinity in DC. Three years later, l stood in my graduation finery and there it was again! This time it was more pregnant, more potent, more pressing than ever! The slender, sanctified, silence was now screaming; silently. How can l place my Manolo toe in that Blahnik? Elatay? My theological education had distanced me from the emotional and experiential and mystical aspects of my faith. The closest l came were the classes in Pastoral care that led me to 5 units and 2,000 hours of Clinical Pastoral Education and my first job as a hospital and then a hospice chaplain. My ten years on the Ambulance as an EMT in Bermuda, had a conjugal visit with hospice Chaplaincy, my new area of ministerial focus. It changed me. But Eight years later that job disappeared into the ether. God, who am I called to be now? Today? Especially, since l have been unemployed for the last five years. There are no savings and no security blanket; but there was an eviction, homelessness, housing insecurity, Chapter 7 bankruptcy, ruined credit, demonic IRS letters, and mounds of debt. There was also illness, hospitalizations and medications with severe side effects. Did God call me to undergo all that chaos to serve some grander purpose? l also have an incurable Illness. How does that fit into the Divine scheme for me? Meanwhile, Howard Divinity taught me that I am a Master of Divinity, but my experiences have shown me that that is henpecked hokum, fertilized in the manure of human hubris. The truth is actually the opposite; On May 9, 2009 l drank the Kool-Aid. l actually believed without question that I could be a Master of Divinity, but that is a lie from beneath hell’s nadir. My experience has taught me that no one Masters Divinity, Divinity always Masters us!!! Today, l see my ministry as faith dancing a merengue with purposelessness, hidden in the belly of a great silent, unfathomable unknown. I remain grateful for slender, sanctified, silences, because they speak the loudest. However, I discovered much to my chagrin, that I can only hear God’s voice most clearly, when I am not speaking. I serve at the pleasure of a God, that Afro-Cuban artist Harmonia Rosales tells me, is a Black Woman. This sable skinned dreadlocked divinity tells me “John-Anthony I love the sound of your dulcet baritone, but l love the sound of your voice even more when you shut up! I found it very difficult to make the decision to retire, because being an audiologist came out of a sense of vocation and a deep gladness that I could help people with hearing problems, but I also have had a strong sense of vocation outside my professional life for a long time, so I have been able to move into retirement with an equally strong sense of vocation in several other areas with less struggle than I anticipated. I feel like sometimes my vocation comes from a place of deep sadness, such as when I hear about wild fires and floods that result in people losing their homes and lives, or of deep outrage, such as when I learn of young children of refugees being taken from their parents and put in cages. Still I feel I can use that sadness and outrage in acting to meet the world’s deep need, such as through the Poor People’s Campaign demonstrations or Grandmothers for Peace vigils. Thankfully I also have a strong sense of vocation that comes from my deep gladness. When I’m able to garden without using chemicals and grow flowers whose beauty I can share with others (even when I have to pick them in the rain), or prepare food with the herbs I grow that others can enjoy, or have garden parties, I believe that is meeting a need. Or when I find joy in spending time with my grandchildren that motivates me to work to reverse global warming or feel able to choose being vegan that helps combat climate change, or passionately write a letter to the editor, I have faith that what I am doing along with the efforts of many others is having a positive effect. In 1989 I was diagnosed with colon cancer. That was a difficult time of facing my mortality, and I feel so grateful to have survived, so every day of just being alive is a source of deep gladness for me, and I view every day as an opportunity to do something significant in the world, even if it is something seemingly small. I believe music has great power, so my pleasure in being able to sing in the choir and lead my Grandmothers for Peace in peace songs is important to me and hopefully helps meet a need. My Grandmothers for Peace group will be singing peace songs in the Lake Harriet Peace Garden on September 30th as part of the 10 days of nonviolence organized by Twin Cities Nonviolent. I didn’t get in touch with my attraction to women until I was in my 40’s, but coming out as a lesbian was liberating to me because it gave me the courage to get out of a bad marriage, and out of that deep gladness to be a lesbian came a book of affirmations for lesbians and gay men that I wrote and hopefully has helped some lesbians and gay men in their deep need for affirmation. Two other sources of vocation are my nature photography, which delights me in being able to share the beauty of our precious earth with others and the great fun I have making catnip cat toys to bring happiness to the cats of the world. So I’m sure you can see why I feel very blessed to have so many parts of my life that comprise my vocation, that help me sense my connectedness with the world and all of life, and are helping me deal with the ending of my vocation in audiology as I adjust to this new stage of my life in retirement. I’ve having a year. A big year. We had a baby. And just last month, we moved into my childhood home to play a different kind of support role in my mom’s life as her Parkinson’s disease progresses. One of my favorite things these days is watching the way both of them – our baby and my mom – light up in each other’s presence. Just last night we got home from being away for a few days and August just about jumped out of my arms as she clapped and giggled and waved upon seeing her Grammy. Her Grammy was equally delighted. These moments are the glue for me these days. Because there are a lot of hard moments too. I wrote these words surrounded by still unpacked boxes in my home office. Negotiating a new normal of daily life as an adult in my childhood home without regressing to teenage tactics is a spiritual practice. Figuring out how to care for the humans I love most in the world as they have evolving needs is an emotional roller coaster ride sometimes. And then there are MY body’s needs. I’ve been really, really sick twice since we moved. My body is yelling for my attention in the only language that seems to get through to stop me. Which leads me to vocation. I have been in a knot about my vocation recently and having a bit of an identity crisis. I am a pastor. My ministry is about building God’s realm of love and justice and wholeness here and now. How in the world do I be a mom and a wife and a daughter too? Why do these parts of me feel in competition? Love is not finite, like pie. But it turns out my time and energy are. I had a breakthrough this week when I was traveling for my consulting work. My family is not in competition with my vocation. My family is a PART of my vocation. 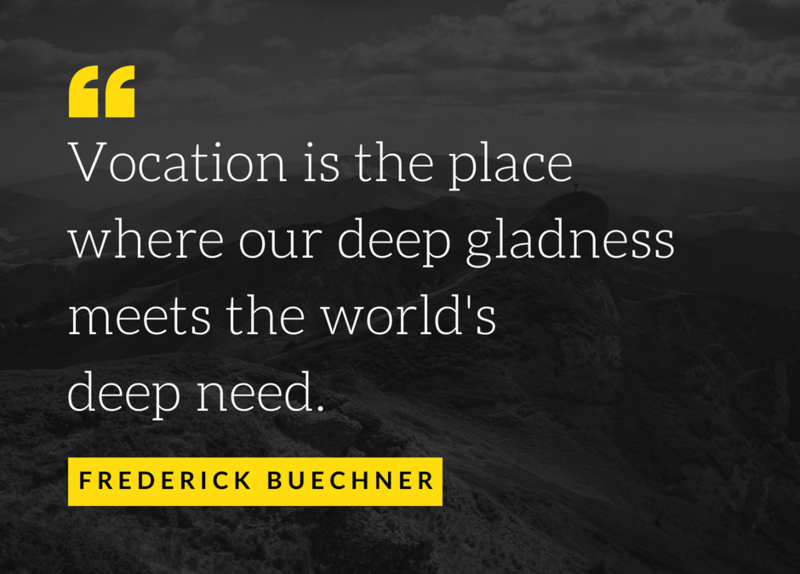 “Vocation is the place where our deep gladness meets the world’s deep need,” Frederick Beuchner. The way I understand what “world” means in this sentence has just changed. The world is no longer only large scale – Earth, this country, this city, this community. The world has to start with my family. Vocation is the place where my deep gladness meets my family’s needs. And then my community’s needs. And wider and wider.